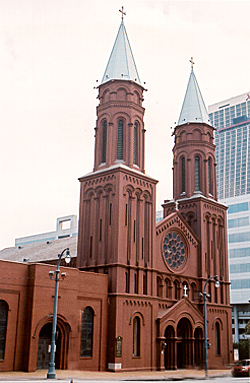 The Church of the Sacred Heart of Jesus is not only important for its unusually innovative revival architecture and the artistry of its stained glass windows and wall paintings, but also for its role as a religious and educational center for the Catholic community of Atlanta for well over a century. The Church of the Sacred Heart of Jesus is regarded as an important work of W. T. Downing, one of the most notable southern architects of the early 20th century. The church is a significant Romanesque Revival design in the context of American ecclesiastical architecture of the period. There have been no alterations since its construction in 1898, other than occasional restorations of paint, changes in the high altar, and the refinishing of the church towers. The land for the church was purchased by the Marist Fathers of Jefferson College in Louisiana in 1897. The property was transferred a few months later to the Marist Society of Georgia. One year later, the church was dedicated by Bishop Thomas A. Becker, Bishop of Savannah. In the 1960s, the ownership of the church was transferred from the Marist Society of Georgia to the Archdiocese of Atlanta. The exterior is built of pressed brick and terra cotta with marble embellishments. Its western facade is composed of two identical towers flanking a central bay and portico containing a vestibule and tribune. The long rectangular mass of the church contains a nave flanked by side aisles and gallery which terminate at an apse. This sanctuary is covered by a single pitched roof. The portico, a tripartite entrance under a corbelled pediment and marble cross, projects from the facade creating deeply recessed doorways. Arched and circular windows light the tympanums above these doorways. Above the entrance and gallery, the gabled bay containing a large rose window supports a corbelled cornice and marble cross echoing that of the portico. Along the side facades, seven strip buttresses rise to a cornice and are contiguous with a corbel table. These buttresses divide the basement floor and the two sanctuary floors into equal bays containing round arch windows. The basement, half sunken into the ground, is used for offices. When it was completed, Sacred Heart was situated in a residential part of town and surrounded with large trees. At the time, many people of Atlanta felt the church was being built too far out of town to serve any useful purpose. Today, the only grassy areas left are two small strips of courtyard on the church's north and south sides. 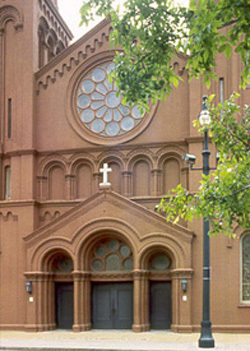 Church of the Sacred Heart of Jesus is located at 353 Peachtree St. in downtown Atlanta. It is open to the public during regular church services; call 404-522-6800 or visit the church's website for more information.